Is 77 Hua Hin’s lucky number? Sam Roi Yod For sale: National park? Jim Lawrie has been a fixture of Hua Hin for many years but we learned of his passing on Thursday. Jim initially came to Hua Hin during the Canadian winters when the golf club he was associated with, Spruce Needles Golf Course, was closed for the winter months. Jim was with this golf course from the out-set, one of the original 12 Horsemen, who first met to discuss the possibility of opening a new course in the Porcupine in August of 1958. Their idea for a new course was apparently spot on as the course opened in the fall of 1960 and is still a popular course in the area today. 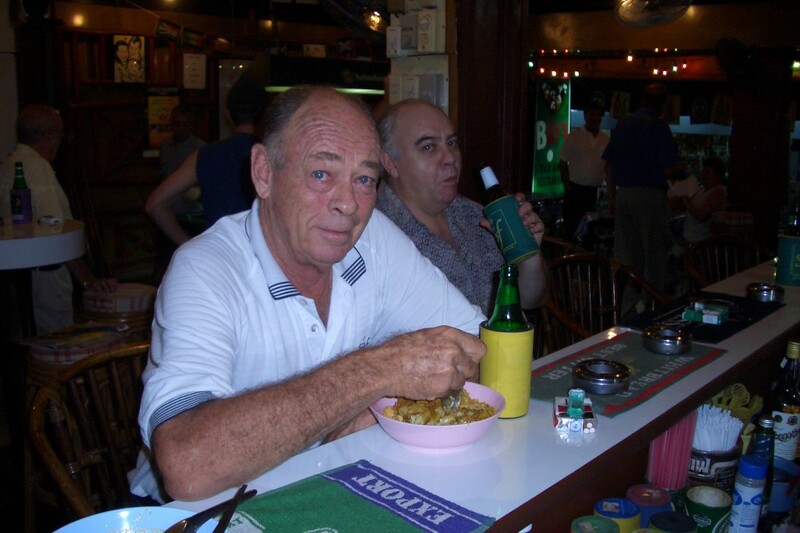 Here Jim is enjoying Khao Soi at Billy’s Bar in early 2004. 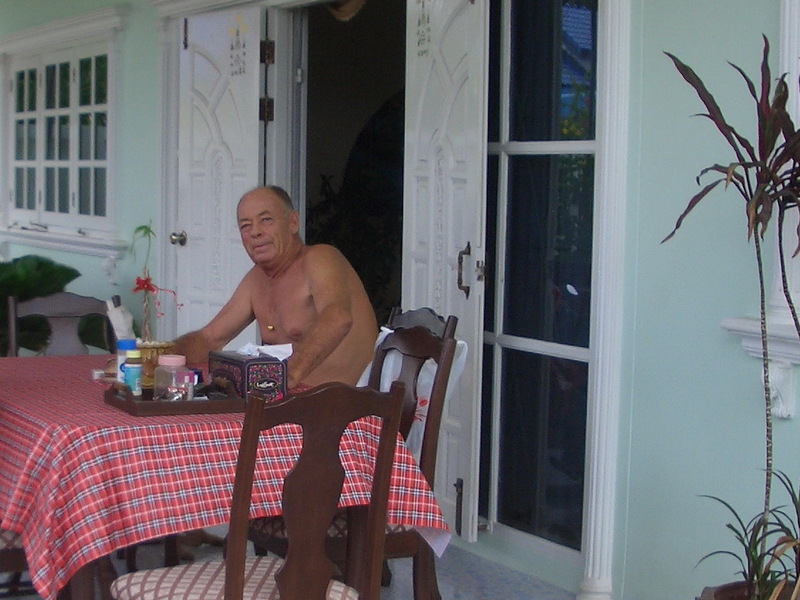 As Jim got older, he started spending more time in Hua Hin and eventually rented a home and then bought one. Here is Jim in June of 2005, shortly after buying his home. He was active with the Milford Country Club, south of Hua Hin, and worked as a teaching Pro there. In his off hours, he could often be found at Billy’s, or John and Ya’s places, playing Yahtzee or cribbage. Jim and friends at a housewarming in Bo Fai in late 2005. He also liked visiting Wat Bo Fai, where he would feed the huge fish in their ponds. Jim had been ill for a while and hadn’t gotten out much, spending much of his time on the front porch of his home. We don’t yet know the details of the cremation but hopefully someone will let me know or leave a note in the comments below. 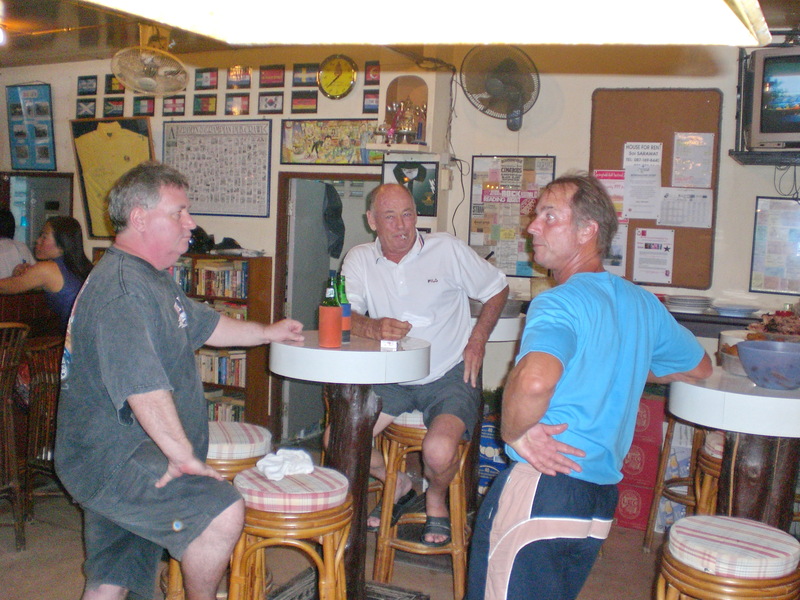 Jim will be missed by many in Hua Hin and many more who met him when they come through town. We were told that they were waiting for Jim’s sister to arrive from Canada before making any arrangements. Today we understand that Jim was cremated on 24 Nov 2013. This entry was posted in beer, golf, Hua Hin by FBF. Bookmark the permalink. Great Photos. Thank you for the memories. Happy to share them. I thought I had more but haven’t found them yet. I worked for Jim for many years and he is one of the best bosses you can ever work for. He was kind and had a great wealth of knowledge in the golf business. He will be sadly missed. I didn’t know Jim professionally but knew him quite a while as a friend. A very good man. I’m glad you found this page. I knew Jim well at his ist job inToronto at don valley where we played together all the time and hung out after. 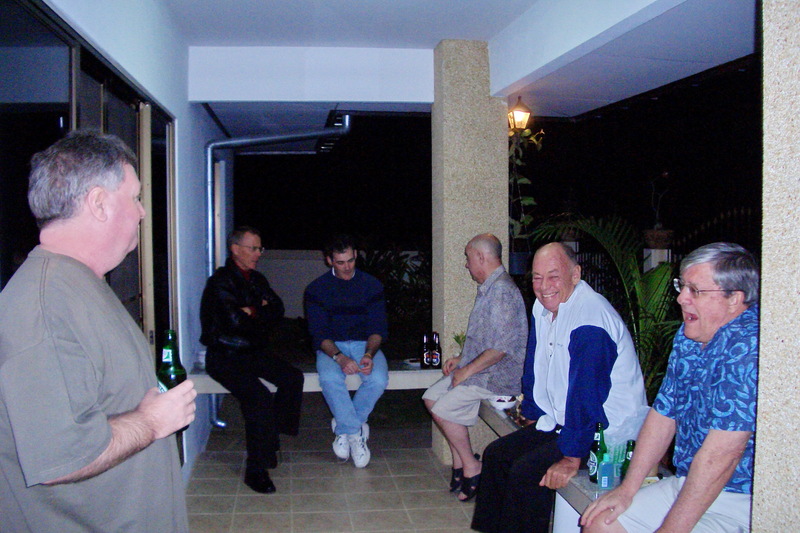 I enjoyed his company very much … he had a good attitude for the game,not too serious…we lost track when he went to camp borden and I went to another city for school…..we did’nt connect for some time when I actually tracked him down in Thailand thru the CPGA ..he said Thailand was the best place in the world to live. Apparently he passed later that year. A good friend I often think of.